Articles about science, and scientists. A new study from Boston University’s Center for Space Physics has determined that wind is an effective option for power generation on Mars! This is especially important to combat times of low solar activity such as we are seeing with the current dust storm, and to balance power needs when a piece of equipment may be in a limited sunlight environment for half the year. Additionally, radioisotope power (ie. 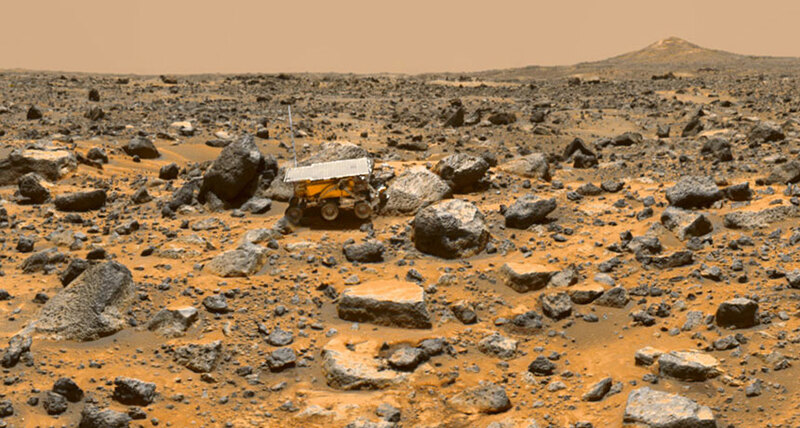 nuclear) as powers the Curiosity rover would be counter-indicated in a polar region as it would impact any science experiments being conducted. The original experiments for this paper were conducted in 2010. At the time it was determined that wind was a possible power source given climate conditions on the Red Planet, however there were concerns over the required size of the turbines given the state of technology at the time. Now with 8 more years of materials science and research behind us, the equipment that could be deployed for this purpose has sufficiently improved that it truly can be seen as a viable option. Another great step forward for Mars! (Figure 1: (left) The wind turbine positioned in the wind tunnel, which is 2m in diameter. (right) Close-up of the wind turbine with the wind tunnel fan visible in the background. Original paper by Christina Holstein-Rathlou of Boston University. When the starting whistle of the universe blew, and our solar system began to coalesce, it now turns out that Mars was running laps around the Earth in terms of planet formation. This is important because it means the planet would have had more than a 100-million-year head start over Earth regarding the development of a viable habitat. The report in the June 27th issue of Nature states that only 20 million years after the dust and gas around our sun had started to form the planets, Mars was up and running! While these discoveries about the early crust formation on Mars may suggest a longer timeframe for possible development of life, it also indicates a relatively thin atmosphere which is a disappointing side note to this work. I suppose none of that will be terribly important once we start terraforming the place, and restoring it to the former glory of a green and blue world! SpaceX is once again getting ready to resupply the ISS, as part of their ongoing contract with NASA to provide that vital service. The launch is scheduled for 5:41am Eastern on June 29th, from pad SLC-40 at Cape Canaveral. The hardware for this mission will include both a previously flown Falcon booster as well as a previously flown Dragon capsule. It’s exciting that the development of the Crew Dragon is moving ahead strongly, and every launch of the existing resupply dragon capsule provides more data and more assurance that the systems are up to the challenge of safely launching and returning astronauts. What a relief it will be soon, to have that capacity within our own control after many years of outsourcing. Mark your calendars for the next Falcon 9 launch, currently on the books for May 31st, 2018. The rocket will blast off from Cape Canaveral Air Force Station’s pad SLC-40 and will be carrying a communications satellite (SES-12) for European telecom giant SES. Current indications are that this will be an older model Block 4 booster which is not planned to be recovered sadly. Pretty soon they will only have Block 5 hardware available and then we will be in the era of major and continuous reuse. Get ready for the next Falcon 9 launch, Tuesday 5/22/2018 at 12:47pm PDT (3:47pm EDT) from Space Launch Complex 4E at Vanderberg Air Force Base in California. This mission will loft NASA’s Gravity Recovery and Climate Experiment Follow-On (GRACE-FO) mission, an extension of the Gravity Recovery and Climate Experiment which was retired in 2017. These precision instruments are intended to track the movement of water on Earth, and are also able to monitor the planet’s gravitational fields. This data will be used to track the planet’s distribution of mass, and to refine models of the ocean and climate. Also launching tomorrow are Iridium Satellites 51-55, which are part of the ongoing construction of the 75 satellite Iridium NEXT worldwide network. This advanced network is intended to provide L-band data speeds of up to 128 kbit/s to mobile devices, along with improved service to marine terminals and high-speed Ka-band service. The Ka-band allows for higher bandwidth communication and is often part of modern satellite communication protocols. The booster for this mission is a Falcon 9 Block 4, which is not intended to be recovered. Pretty soon all missions will be flown with the highly reusable block 5 rockets, which will ensure a landing show every time. The deploy of this varied cargo turns out to be a pretty interesting challenge for tomorrow’s launch, as it must happen at two very different spots along the voyage. The NASA GRACE-FO mission needs to be deployed at 300 miles of elevation, which is intended to take place midway through the 2nd stage burn, so it seems. The burn will pause at the 305 mile mark, the NASA payload will be deployed, then burn will recommence and continue to a 500 mile elevation for the Iridium hardware. This all sounds like yet another amazing plan and raises the bar once again for what can be done with commercial (and low cost!) rocketry. Hopefully the cams will be working and we will all get a heck of a show! For the short history of mankind in space, there has typically been a prohibition on alcohol consumption once you are up there in orbit. Well, more precisely that rule has been applied to American astronauts – I really can’t say about the Cosmonauts except I hope that someone was having a good time up there! The theory of course being that space is a very dangerous place, and it was very expensive to get you up there. As a result, you have to be on your A-game all of the time, conducting important experiments, taking good care of yourself, and not messing up any of the sensitive equipment. Plus due to the outdated methods and equipment still being used to launch goods, it costs about $10,000 per pound to get materials into space. When SpaceX is able to lower that cost (very soon) then firing your case of booze into the heavens with you becomes a lot more doable. It is a testament to the normalization of space travel that we can now have the conversation about being able to relax in that environment, instead of being a scientist/test pilot/NASA expert 24×7. Granted astronauts in recent times haven’t been all business to a fault, but have made time to show the public the more fun side of space, in an ongoing effort to keep people interested in our future among the stars. One recalls Chris Hadfield and his frequent guitar videos to show us at least a little fun being had while on assignment. 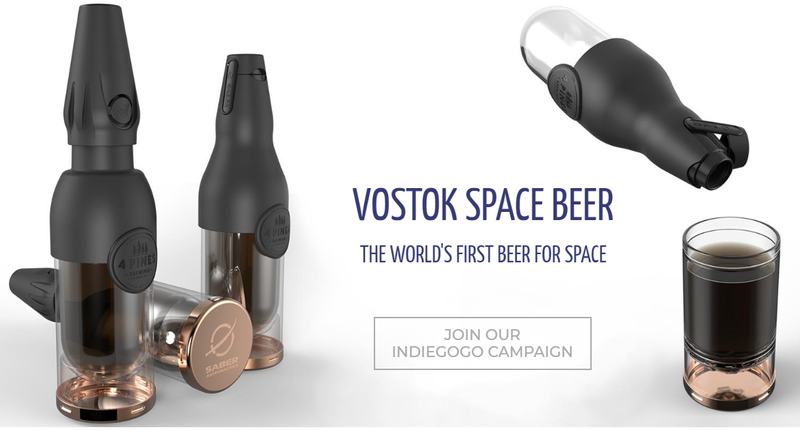 Well, if you want to kick back with a cold one while you listen to Hadfield’s latest live performance, 4 Pines Brewing Company has just the product for you: they have teamed up with Saber Astronautics to create Vostok – The World’s First Beer for Space! They approached this goal as true pioneers and scientists, considering the changes in human physiology effecting alcohol absorption, the challenge of pouring in zero gravity, and even how strange and uncomfortable a beer-burp is up there. I’m just glad that someone is thinking about these things, and it reminds me of the soon-to-be prophetic words from Elon Musk regarding Mars. In his SXSW Q&A, his reply to how we can all help with the space effort was: they will get us there and provide a stable environment where the flowers can bloom, then the entrepreneurs must step up to provide the business and innovation. Small steps like this beer, while seeming perhaps trivial, are actually laying the vital groundwork, critical in allowing basic humanity to exist off of our original home world. I like to imagine a time in the not-too-distant future where someone will be enjoying the track ‘Space Beer’ by thrash metal stalwarts and beer heroes Tankard, while on the way to the 4th planet with ‘old home’ receding in the background, enjoying a fine Vostok. NASA continues to impress, reminding us all that they were in fact the founder of this feast that we are all enjoying so very much. Just a few days ago they announced plans to send a small, autonomous rotorcraft to Mars, as a passenger on the planned Mars 2020 rover mission. The main purpose of the chopper is to demonstrate the viability and potential of heavier-than-air vehicles on the Red Planet. NASA is also wasting no time in positioning it as a ‘first’, meaning the first nation to fly a craft on another world. That’s fair enough – so let’s get the marscopter there, get it aloft, and start streaming back some excellent images! After yesterday’s scrubbed launch at T-0:58 seconds, SpaceX is scheduled for another launch window at 4:14pm EDT this afternoon 5/11/2018. The scrub of yesterday’s launch took place 2 seconds after internal computers took over the countdown and launch prep, so something that the rocket itself saw made it not want to launch. Perhaps it was just too comfortable on the pad – hopefully they gave it a good talking to last night. Be sure to tune in to the live stream at 4pm for all of the exciting build up! Happening this week, from May 8-10 at the George Washington University in DC, is the Humans to Mars event. Heavy with NASA and Boeing speakers, we also see Josh Brost, Senior Director, Government Business Development at SpaceX on the agenda, who participated in a round-table discussion on May 9th. I am continually excited that the conversation about this next bold step for mankind is intensifying, having tipped over what I hope is critical mass to make sure it actually happens – and quickly. I hope many Gazettians are younger and can look forward to a long lifetime of exciting solar system exploration, but your humble author is no spring chicken! We need to make this happen pretty soon! This is the last day so events end early at 1pm, but there may be some static content to emerge from this event about which we will let you know! 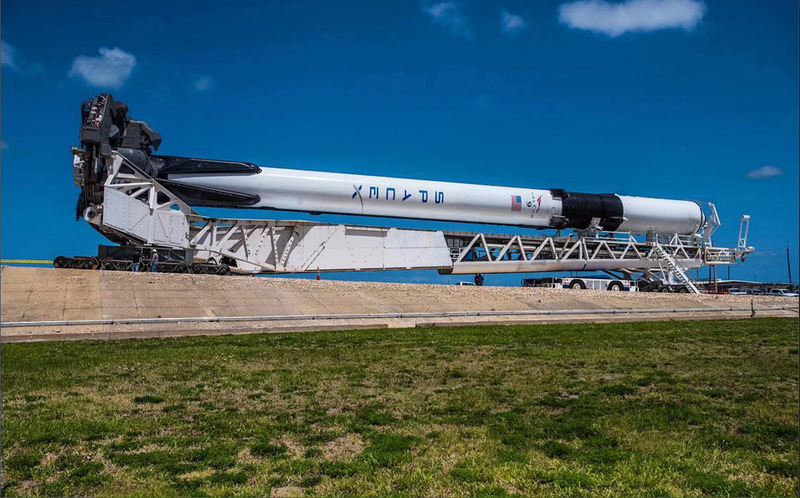 After delaying the initial launch estimate of Monday, May 7th while results of the static-fire test conducted on Friday, May 4th were evaluated, SpaceX has just announced today that they plan to fly the new Falcon 9 Block 5 on May 10th. This is a tremendously exciting launch that will begin a new era of the SpaceX company as well as reusable rocketry and human space flight, and if we are all very lucky we will also see Elon begin to name this new batch of rockets!